This was just amazing! One of the best moments of our vacation in Canary Islands. Not even that the whole crew was friendly, enthusiastic, fun and informational, they even spend extra time with us at the sea, because it took as longer to find the family of whales. They didn't rush us back and gave us a chance to spend time with beautiful creatures and enjoy our unique moment. 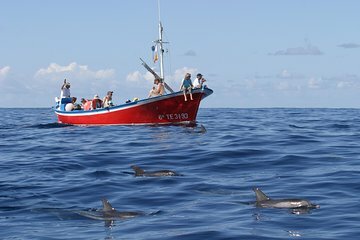 What I see as the best value of this service is the fact that it is small fisher boat with a few people on board which makes it even more friendly, authentic and intimate. Everything was just perfect incluiding the rain and wind at the end : You shoudn't think twice, you will not regret it and even if you will not see any whales or dolphins which might happen, you will enjoy a nice time at a sea with friendly, passionate people. Greatly recommended. Had a nice time. Tour operators were friendly and informative. As with all whale watching tours, there's no guarantee about what you'll see. We saw quite a few dolphins, one whale, and one small shark. A wonderful trip. Melanie was a very warm, enthusiastic and informative guide. It was great to be out on the sea in a small group on a small fishing boat. It allowed us to feel close to the dolphins and the wales. Experience of a lifetime. Unforgettable. Unforgettable trip! Melanie and Carmen were brilliant hosts, Melanie is very friendly and very passionate. We saw Spotted Dolphins, Bottlenose Dolphins, Pilot whales including a fresh calf from that day and a hammer head shark! The tour is very respectful to the animals unlike other trips we saw! It was fantastic! We saw lots of Dolphins. Jumping, swimming next to the boat for more than an hour. Melanie and the schipper were kind tell a lot of interest things. Very nice boat also. I will recommend this trip to everybody! Melanie also spotted de blow of a whale, but we didn't see one. So we have to come back for whales!